Good friends are like good wine, they have depth. Courage is like a muscle, it gets stronger with practice. 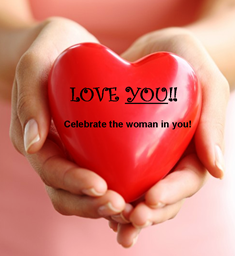 Celebrate The Woman Within You!! Give yourself permission to truly get in touch and know the woman you are. This is a joyful, powerful, and Insightful seminar. A woman's seminar to celebrate your feminine energy! Come to share, experience, and celebrate the magic of truly knowing yourself as a woman! YOUR SATISFACTION IS GUARANTEED. IMMEDIATELY COMPLETING THE CLASS, THE INFORMATION AND TOOLS YOU RECEIVE MUST MATCH THE VALUE OF YOUR INVESTMENT OR WE WILL REFUND YOUR FEES IN ITS ENTIRETY. Over yonder, there are other ducks, which are turning somersaults, diving for food. It seems they know their surroundings and yet remaining detached, for they are not dependent on someone feeding them. Valentine’s Day was so much fun. I was helping out my youngest daughter who is co-owner of a flower shop with delivering flowers. Being the ‘runner’ on this day, the busiest day of the year for the florist industry, is the best – seeing a face light up with a big smile is heartwarming! Those smiles made me smile. On a delivery I met a lady at the counter, stating the recipients name, she said “no one here by that name" and gave me directions to where I would locate her. Thanking the lady and wishing her a nice day, I was on my way. Preparing for the next delivery, I realized I had overlooked a bouquet - it went to the lady who had given me directions. A Kodak moment ... It was so special to tell her the arrangement was for her – she was surprised, saying "for me?" I replied, "this is for you!" Several gentlemen added to her day by saying they knew the delivery was for her and she deserved them (the flowers). Everyone was smiling. Isn’t this what love is all about? Flowers are a wonderful gift – more than the gift, it’s how you and I feel as we give and as we receive. Yes, this is love. Wishing you love and laughter!